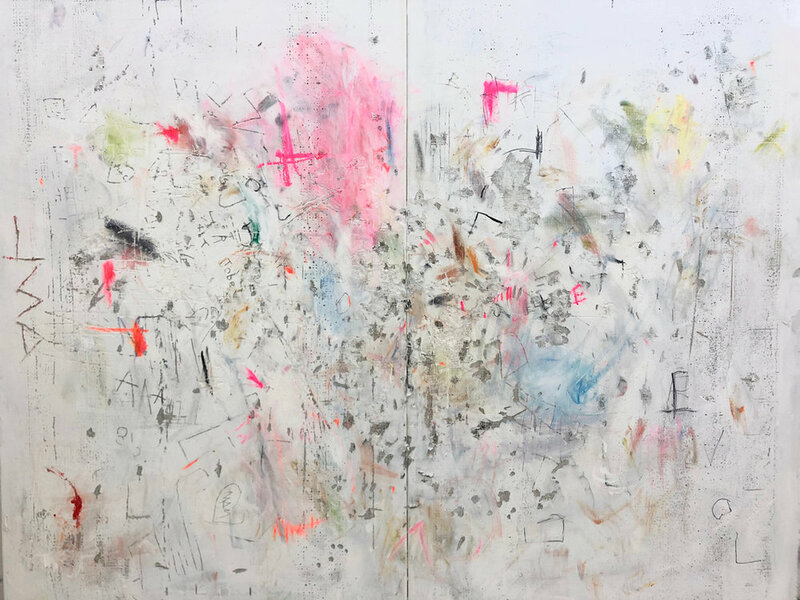 Matthew Ross is an la-based mixed media artist exploring contemporary ruin. his pieces, created from raw materials found on (and inspired by) the streets of los angeles, are grounded in the idea that urban decay can both tell the history of a place and write a new language for future civilizations to have an understanding of our present society. we chatted with matthew on how he sources materials, his intention of creating future artifacts, and what his work says about our city. Asymmetric Magazine: Tell us about your current series. Matthew Ross: Currently I am producing a body of work that studies and develops, in depth, the concept of contemporary ruin in western society. Through a lot of research and experimentation in cross disciplinary areas, I have stumbled upon an abundance of subgenres that act as evidentiary systems in a broader psychological and metaphorical concept pertaining to morphology in American contemporary thought. In particular, my series highlights the ambiguity of 'American Identity' and its damaging effects on our historical continuity through the scope of the neglect and defacement of the built environment and the way that the resulting urban vernacular acts as a sort of timeline and record of human involvement. 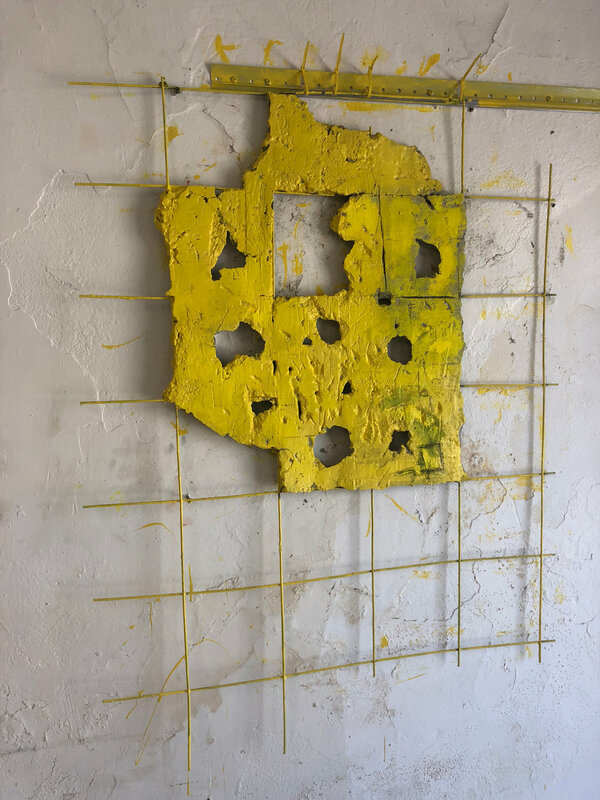 Materials-wise, I employ the use of low brow, raw, and mundane materials such as various structural and functional metals, concretes, rubble, zip ties, and industrial wiring to create artifacts and ruins, as well as hyper-intensive studies of other themes I explore. AM: What are the other themes aside from urban decay that you pursue? MR: Other themes I explore are immediacy, preserved entropy, nostalgia, synaptogenesis and urban vernacular. AM: What's your process for sourcing materials? Do you seek out specific items or do you let what you come across around the city drive the pieces? MR: Definitely both. A lot of the materials I use are specific and difficult to find in the state I need them, and those I source from places like specialty industrial metal suppliers and specialty construction materials warehouses, and Home Depot. I do also scavenge a lot of material, but it's usually for accents within the work, like fake jewelry, electrical wires, or concrete slabs. A lot of this is found just walking around or finding yourself in a store or area you'd normally not find a need to go to. AM: Tell us about your intentions of your work being future artifacts. MR: I've always been fascinated with history of ancient civilizations, like the Roman Empire, and in particular, the way archaeologists are able to decipher the rule, laws, and languages of the society. For example, when you walk down the street and look at the concrete, or public benches, or a storefront window, you’ll see messages, or letters, or words, scratched into them, which changes depending on where in the city you are. Much of this type of urban vernacular is highly ambiguous, dire, and random, kind of like a journal entry not intended for a third party–the opposite of most graffiti. When you look at these markings over and over, you’ll notice patterns or similarities that, for me, are very informative and nostalgic. You can also see the way the built environment acts as a timeline of human involvement in a way that an archaeologist would be able to decipher some of the most genuine societal subtleties. Another form of artifact that I chose to create because of its universal familiarity are 'Preserved Curbs (red, yellow, blue)' to parallel the street laws we are so accustomed to and the way that color and material would be so easily decipherable in the future as a roadmap of a very familiar group of street laws. One stylistic example that I incorporated into some of my concrete pieces are drilled holes. These parallel what happened to many of the Roman Ruins of the Acropolis during the fall of the empire, where its citizens stole tons and tons of iron from the Coliseum, Pantheon, etc. to forge weaponry. If you go to Rome soon, keep an eye out for the thousands of holes in the ruins. AM: So, what do you think your work says about Los Angeles? MR: That it is visually and socially one of the most interesting, study-able environments, and that if you look beyond the obvious, you’ll find such genuine beauty. It is a microcosm of many of the themes in my work: the beauty of decay, urban neglect, hysterical adoption of trends, immediacy, entropy–to name a few. I love the feeling of capturing nostalgia, and for me, LA is an abyss of it. I love the feeling of capturing nostalgia, and for me, LA is an abyss of it. AM: What music are you currently jamming to? MR: I vary a lot, but usually I’m jamming to a combination of Charlie Parker and My Bloody Valentine. MR: Further exploration of this series and its relevance to a lot of what’s happening in this country. I’ve got so many pieces in my head I’m planning to make, and I’m just riding that. I’m also beginning to prepare for two solo shows in LA to finish off the year where I will be showing much of this new work. View more of Matthew's work at matthewadamross.com.